← Party Like It’s 1999: Web 2.0 Exuberance? Sigh. Since my original email about Citibank spamming me, I wrote directly to William R. Rhodes, CEO of Citibank (see Citibank Letter). Typically, writing to the CEO gets an immediate response. I sent this out on September 31, 2007. And what happens? No, I didn’t hear anything from Citibank. Instead, I received yet another a spam email (see below) that was the crux of my original frustrating situation. ARGH! Isn’t this a great way to engage with your customers, especially when you consider I’m used both old school (snail mailing a letter) and new school (blogging about my frustration) ways to highlight my situation. I know I said I would write to the BBB and DMA in my last post. I thought, just thought, that writing to the CEO would actually elicit a response. Boy was I wrong. Check out the latest “offer” below. Note irony of adding money to an e-savings account that I closed in May. Obviously, they’re using “updated” information about my relationship with them. Or do they think I’m expendable for the sake of getting some of their customers to click through on their offers? 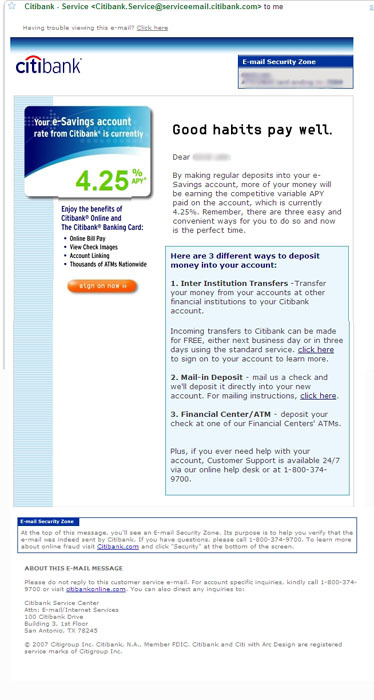 This entry was posted in Citibank, email marketing, marketing, permission marketing, pr, public relations and tagged Citibank, Citibank letter, email marketing, marketing, permission markting, pr, public relations, spam mail. Bookmark the permalink.